During the end of June and beginning of July 2003, a salvage excavation was conducted northeast of Horbat Pelah (Permit No. A-3942; map ref. NIG 19300–08/61398–400; OIG 14300–08/11398–400), prior to the installation of an electric pole along the patrol road. The excavation, undertaken on behalf of the Israel Antiquities Authority and underwritten by the Israel Electric Company, was directed by E. Kogan-Zehavi, with the assistance of A. Hajian and H. Moyal (surveying and drafting), H. Stark (GPS), T. Sagiv (field photography), I. Lidsky (drawing) and A. Nagorsky. One square (4 × 6 m; Figs. 1, 2) was opened along the western slope of a hill; building remains from the Early Islamic period (Strata I, II), cist graves from the end of the Byzantine period (Stratum III) and a few building remains from the Byzantine period (Stratum IV) were exposed. Remains of a ruin and a cistern were visible on the hill, to the northeast of the excavation. Stratum I. The end of a wall (W5; preserved height 0.25 m) built of coarsely dressed stones and aligned east–west was exposed in the southeastern part of the square, at a depth of 0.2 m below surface. A floor of small fieldstones (L2) abutted the wall from the north. The soil fill above the floor contained numerous fragments of pottery vessels from the eighth–ninth centuries CE, including cooking pots (Fig. 3:2, 3), a jar (Fig. 3:4) and a fragment of a lamp (Fig. 3:6), as well as roof tiles, lumps of white mosaic, marble fragments and a few pieces of glass vessels and window panes. The rims of a bowl (Fig. 3:1) and a jar (Fig. 3:5) that dated to the Byzantine period were discovered below the floor. Based on the ceramic finds, the wall and the floor could be dated to the eighth–ninth centuries CE. Stratum II. A section of a corner (W4; length 1.3 m, width 1.1 m, preserved height 0.5 m) was exposed in the northeastern part of the square. It was built of coarsely dressed stones on the exterior face and small fieldstones on the interior. Two stone floors abutted W4 from the south; one floor (L7) abutted the upper part of the wall and the other (L17) joined its bottom part, hence being the earlier of the two. Another floor of tamped earth (L10) whose elevation matched that of Floor 17, was exposed on the inside and north of W4. The artifacts above Floor 7 included a few potsherds from the Byzantine period and fragments of glass vessels and tesserae. A fragment of a Late Roman C bowl with a black rim (Fig. 3:7) dating to the sixth century CE and a jar rim (Fig. 3:8) that was common to the sixth–eighth centuries CE were found in the soil fill between the Floors 7 and 17. Four round beads of turquoise colored glass, one of which is complete, were discovered on Floor 10. Stratum III. 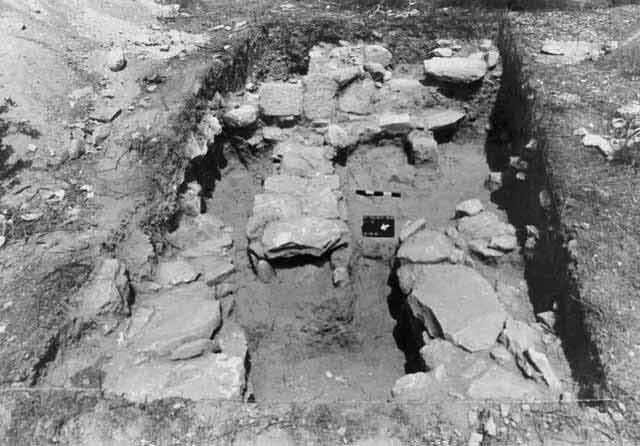 Six cist graves (0.8–1.0 × 2.3 m), oriented east–west, were exposed below the level of Floors 10 and 17 of Stratum II. Three of the graves (T13, T14, T19; Fig. 4) were discovered on the western side of the square, two graves (T20, T23) were below the walls of Strata I and II and another grave (T22) was discerned in the square’s northern balk. The graves (not excavated) were built of dressed rectangular stones and covered with stone slabs of various sizes. The soil fill above the graves and below Floor 17 (Loci 8, 12, 16) contained many potsherds, including imported African Red Slip bowls (570–625 CE; Fig. 3:9), kraters (Fig. 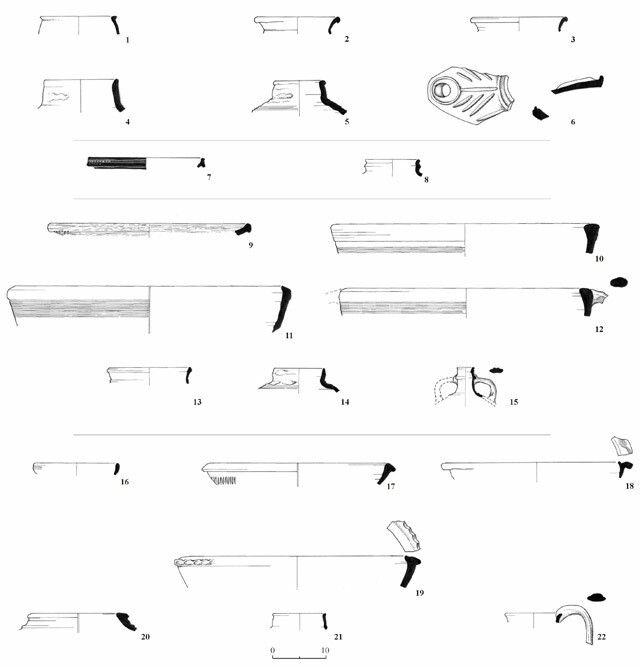 3:10–12), a cooking pot (Fig. 3:13), a jar rim (Fig. 3:14) and a flask (Fig. 3:15) that dated to the end of the Byzantine period and extended into the Early Islamic period. Stratum IV. 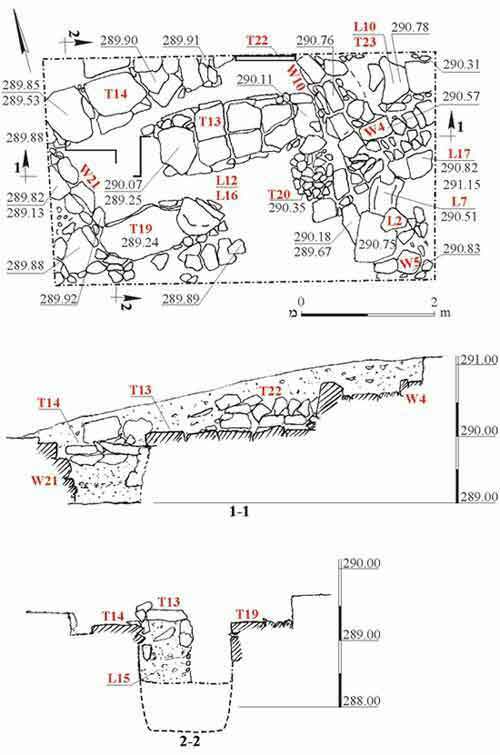 A wall (W21; exposed length 1 m, width 0.5 m), oriented north–south, was revealed in the western part of the square. Built of two rows of dressed rectangular stones, it was preserved two courses high. The wall’s southern side was cut by T19 and its northern part continued beyond the excavation area. The soil fill below the graves and beneath the wall’s foundation (L15) contained potsherds from the Byzantine period (sixth–seventh centuries CE), including a bowl (Fig. 3:16), a Fine Byzantine Ware slipped bowl (Fig. 3:17), kraters (Fig. 3:18, 19), jars (Fig. 3:20, 21) and a jug (Fig. 3:22). The excavation of Strata I and II seems to indicate that a building from the Early Islamic period stood nearby; it may have been paved with a mosaic, covered with a tile roof and its windows had glass panes. 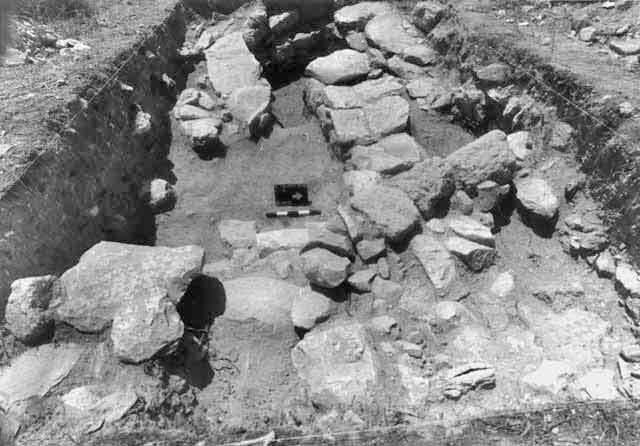 The cist graves, exposed below the building remains, were earlier than the building and should be dated to the latter part of the Byzantine period. The number and density of the graves suggest that they were part of a cemetery located in the area. Other tombs had previously been discovered west of the excavation during backhoe work, which was suspended and the tombs were not excavated. Wall 21 in Stratum IV clearly predated the tombs, as it was severed by one them. 2. The excavation area, looking west. 4. Cist graves 13, 14, 19, looking east.